When Mr. S and I first move to Tokyo, we ate out almost every day because we had none of our pots, pans, and cooking utensils. Although we had some rental kitchen items, we were seriously tempted by the thought of exploring our new neighborhood, and beyond, for delicious dining options. There were however, nights on which I cooked for us, which always seemed to end in scorched rice, a result of cooking rice in a metal pot on a finnicky gas burner. It was on these occasions I realized how spoiled I had been to have had my trusty electric rice cooker back in SF, from which emerged perfect rice every time, without fail. And so, out the door we went night after night, to try something new. 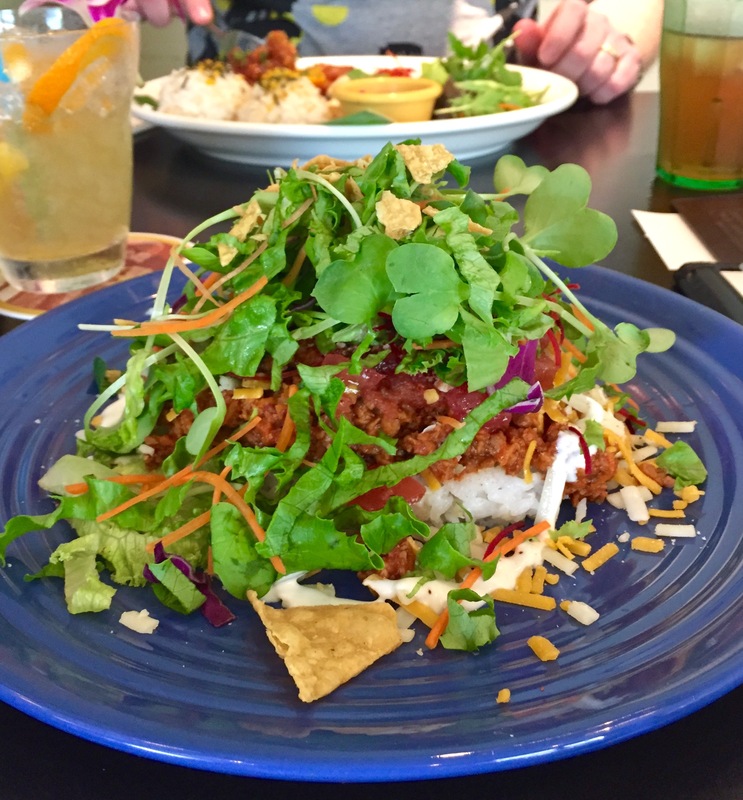 I started to see something called “Taco Rice” on quite a few menus. Funny, I thought, Japanese people sure do love Mexican rice… and beans?? Up until now, the only version of Taco Rice I’d encountered was my sister-in-law’s version, which was a cooked yellow rice salad with corn, beans, and chili seasoning. And then, one day whilst waiting in line to order lunch at the Monocle Café in Ginza, I was set right by, of all things, the glossy shellac-ed “sample” food in the display case. There it was, a shiny plate of タコライス (Taco Raisu), sitting beneath 12 volt bulbs. 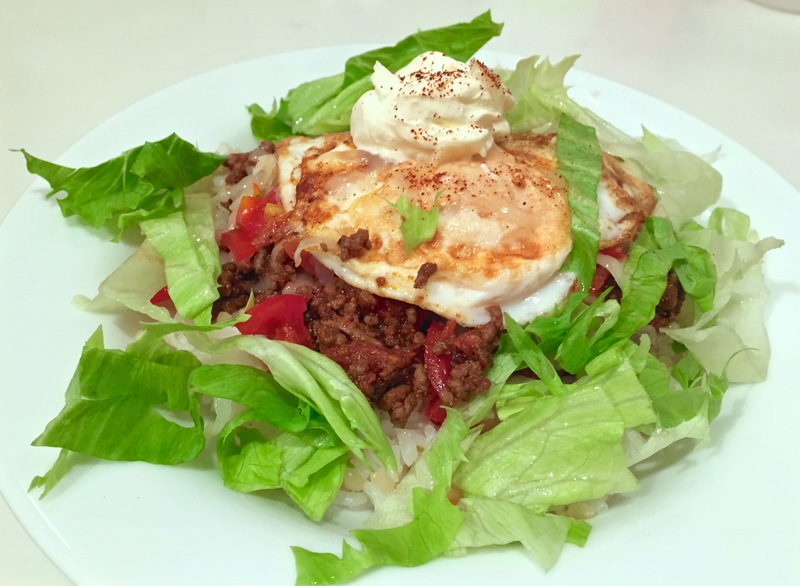 It was strangely enticing, this plastic-y dish of what looked to be white rice, ground meat, iceberg lettuce, shredded cheese, and an egg on top. I wasn’t far off in my estimation when, 10 minutes later, a bowl of it arrived at our table, a perfect clone of what was in the display case, minus the lacquer. 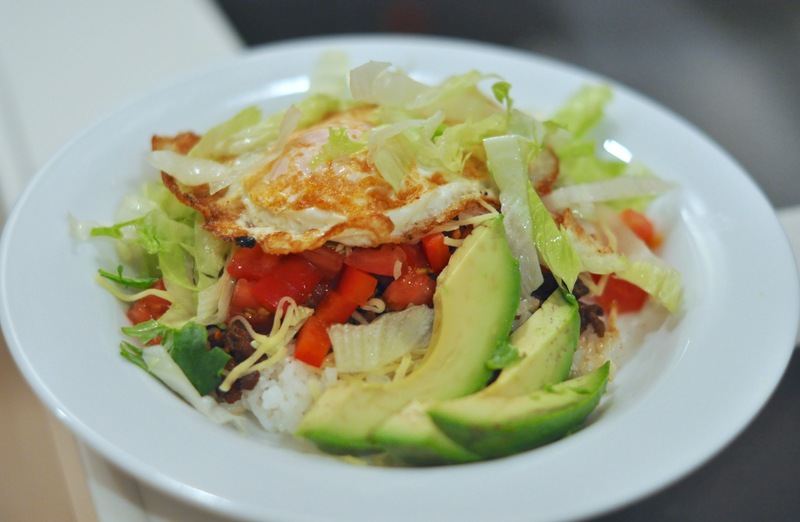 Taco rice is an Okinawan dish that consists of ground beef with taco seasonings, shredded cheese, lettuce, tomato and salsa, served on a bed of white, Japanese short-grain rice. The story goes that tacos, a common food on the U.S. military base in Okinawa, when first introduced, soon got a makeover by local eatery owners who sought out a cheaper and more satisfying replacement for taco shells: rice. It’s a ubiquitous dish in Okinawa to this day, and quite popular throughout the rest of Japan. To suit Japanese tastes, some recipes add soy sauce and sake, in addition to taco flavorings, to the ground beef. 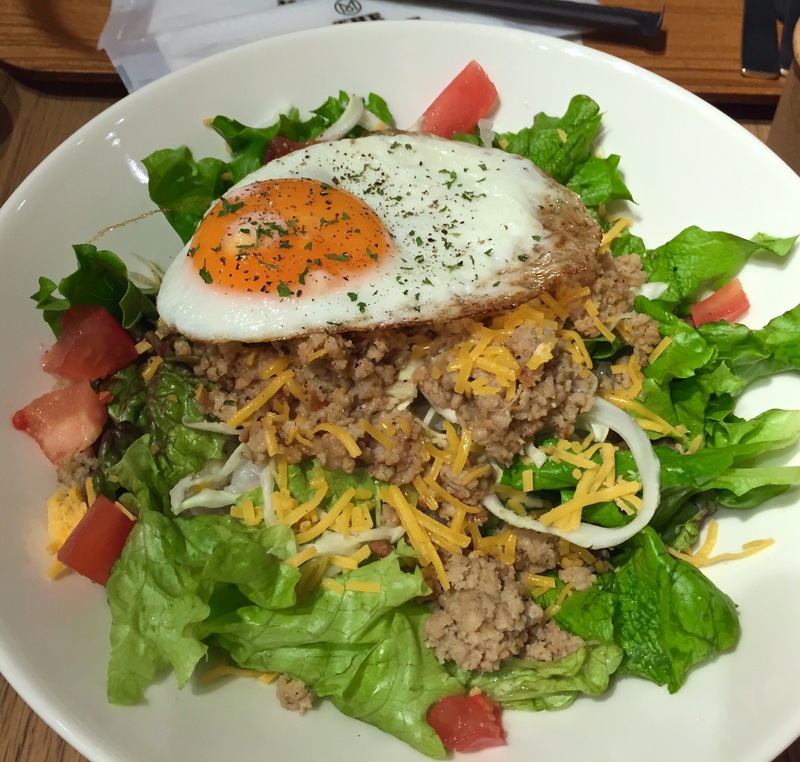 Monocle Café’s version, which uses ground pork rather than beef and tops it all off with a fried egg, would do wonders for a nasty hangover. 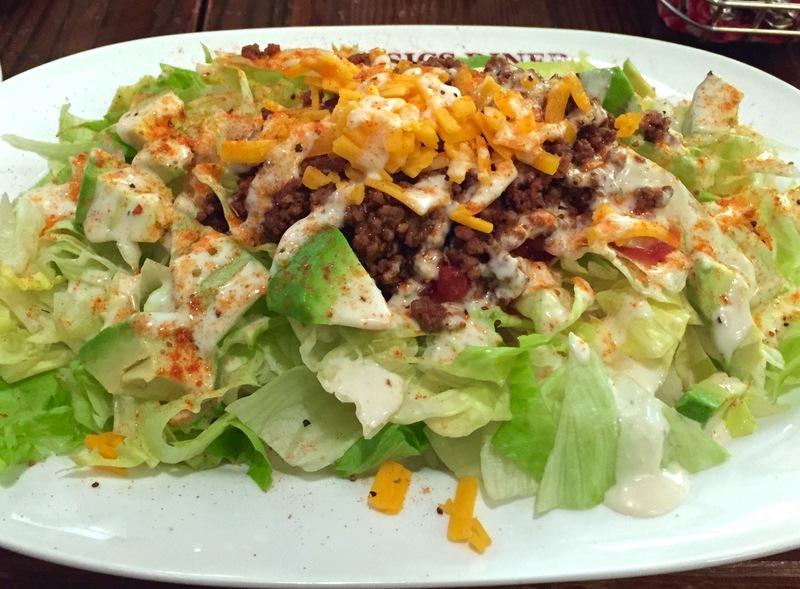 Other restaurants’ versions of Taco Rice, with the more traditional ground beef and sans fried egg, have equally been as satisfying, while others have gone the vegetarian route and substituted ground beef with tofu. And there are still other bowls I’ve yet to try, including Taco Bell’s 530 Yen version and Aloha Table’s Hawaiian pork version. As you can see, the modular components of Taco Rice lend it to be a highly versatile dish. It comes together quickly for an easy weeknight dinner. I’ve made it several times now for Mr. S and me, using store-bought Mexican taco seasoning, which you can find almost at all grocery stores here in Tokyo. Here is my base recipe, including some optional variations. Enjoy! *I usually cook up a mixture of white and brown rice for texture. The ground beef: In a fry pan, over medium-high heat, cook the ground beef until it turns just lightly brown. Add all the dry seasonings, and cook for 1 minute. Stir in the diced tomato and juice and cook for another 1-2 minutes. Assembly: In a shallow bowl, add a base layer of rice, then top with the ground beef mixture. Add diced tomatoes and shredded cheese, and top off with a fried egg. Add the shredded lettuce around the perimeter of the bowl. Add any other desired toppings.